Explore Victoria, from the rich heritage of its First Peoples to its diverse natural environments, in one of Australia’s premier museums. Melbourne Museum is one of the most visited attractions in Melbourne. The museum covers a wide range of topics with incredible detail, and features extensive permanent displays and temporary exhibitions. The museum is separated into eight distinct galleries across three levels. On the upper level, explore the continually evolving story of Melbourne through a collection of over 1,200 objects. While in the Melbourne Gallery, pay your respects to one of Australia's greatest sporting icons, the racehorse Phar Lap. In the Forest Gallery experience the fauna and flora of Victoria, then learn more about your own inner workings in the Mind and Body Gallery. On the ground level, share the stories of Victoria’s First Peoples in the much-loved Koori Voices exhibit. Wander through the full-scale skeleton of a Blue Whale, and explore Earth’s geology and biology in the Science and Life Gallery. Kids will love the interactivity of the Children’s Gallery and Garden. On the lower floor you’ll find an IMAX Theatre that screens both blockbuster films and documentaries. Temporary exhibitions focus on art, design and culture, and have included aboriginal artifacts, industrial design and photography. Delve a little deeper into the museum by taking a guided tour, visiting the free Discovery Centre research facility, or by attending a talk from the ever-changing lecture program. The extensive gift and book shop is the perfect one-stop spot to do all your Melbourne souvenir shopping. The Museum Café serves contemporary snacks and meals. Located just north of downtown, Melbourne Museum is part of Carlton Gardens and stands opposite the stately Royal Exhibition Building. It’s within easy walking distance of downtown and there are numerous tram and bus routes nearby. There is also a user-pay car park on site. The museum is open daily except Good Friday and Christmas Day and there is a fee to enter. Examine our Carlton things to do page to find more activities while you're here. Delve into Melbourne’s fascinating heritage when you explore this cultural landmark and architectural treasure, containing over 150 years of state history. Melbourne’s humming open-air retail precinct contains over 120 stores, including fashion boutiques, department stores, cosmopolitan bars and great dining venues. Envision 19th-century Melbourne at this magnificently restored shopping arcade in the heart of the CBD. Visit boutiques, confectioners and chocolatiers. Browse fashion goods, sample creamy chocolate and relax with a tea in this elegant arcade, which remains one of Melbourne's finest historic and architectural landmarks. Rise above the city when you visit the highest viewing platform in the Southern Hemisphere and look out across the sprawling Melbourne skyline. See the edgy architecture of Melbourne’s main civic space, a great place to take in an event, explore a museum or simply people-watch. Go to the highest observation deck in the Southern Hemisphere at this soaring residential tower, which also offers fine dining with breathtaking views. Lovers of classic cinema, budding film makers and avid gamers will all delight in one of the world’s leading moving image museums. Melbourne’s premier retail precinct is filled with boutiques and big department stores set in charming heritage-listed arcades. Experience the harsh justice of the 19th century and trace the final footsteps of bushranger Ned Kelly at this award-winning museum. See blockbuster international touring exhibitions and the world’s largest collection of Australian art at this revered cultural institution. One of Melbourne's best-loved performance spaces offers the latest live music, comedy and theater in a spectacular old-world setting. Catch a rare view of Southern Ocean and Antarctic marine life at one of Australia’s premier aquariums. These charming gardens and antique buildings are an ideal spot to relax within a gentle walking distance of the city. Rising from the edge of downtown Melbourne, Australia’s tallest cathedral is an oasis of serenity and a towering example of old-world artistry and craftsmanship. Considered by some to be Melbourne's most spectacular landmark, this majestic theater has been entertaining audiences since it opened more than 150 years ago. Appreciate the peaceful atmosphere when you explore the interior of this vast neo-Gothic cathedral and architectural anchor in Melbourne’s inner-city streetscape. This museum commemorates the extraordinary journeys of settlers who came from all over the world to make Victoria home. 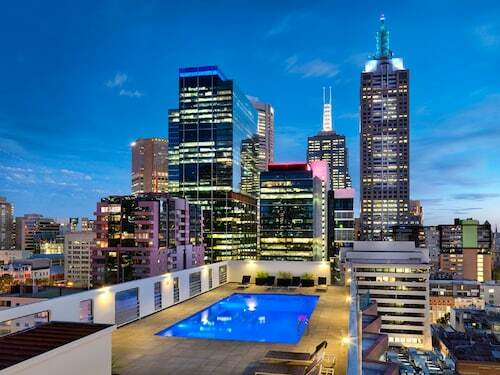 Located in Melbourne Central Business District, this aparthotel is within a 10-minute walk of Flagstaff Gardens, Queen Victoria Market, and Melbourne Central. Emporium Melbourne and Festival Hall are also within 15 minutes. Flagstaff Station is only a 4-minute walk and Melbourne Central Station is 7 minutes. Located in the very heart of the city, the hotel is walking distance to world class shopping, famous theatres, major sporting venues, vibrant entertainment, exceptional restaurants, Crown Casino, and the Melbourne Exhibition and Convention Centre. 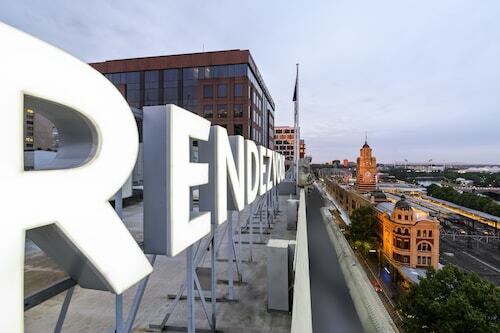 Set within the Southbank shopping/business complex and 200 meters (656 feet) from Yarra River, this modern-style hotel is just across Princes Bridge from the city center and within walking distance of Eureka Skydeck 88. 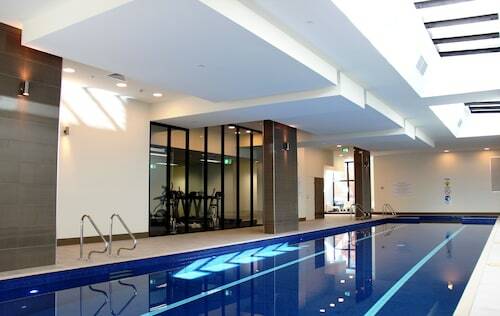 The Victorian Arts Centre, Crown Casino, and Melbourne Cricket Ground are nearby. Located in Chinatown, this hotel is steps from Comedy Theatre and Her Majesty's Theatre. Princess Theatre and Bourke Street Mall are also within 10 minutes. Parliament Station is only a 4-minute walk and Melbourne Central Station is 13 minutes. 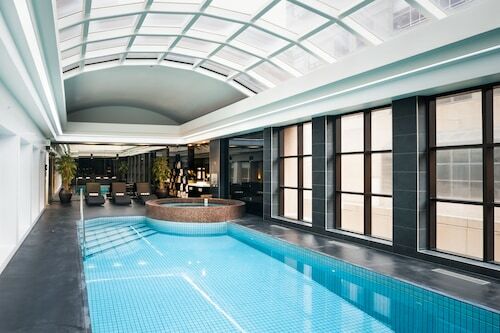 Located in Melbourne Central Business District, this luxury aparthotel is within a 5-minute walk of Collins Street, Her Majesty's Theatre, and Flinders Lane. Bourke Street Mall and Princess Theatre are also within 10 minutes. Parliament Station is 6 minutes by foot and Melbourne Central Station is 14 minutes. 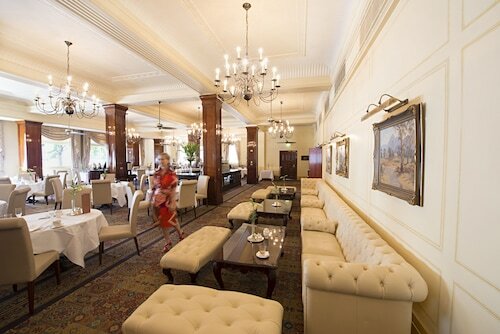 This family-friendly Melbourne hotel is located in the historical district, just steps from Comedy Theatre and Her Majesty's Theatre. Princess Theatre and Melbourne Central are also within 10 minutes. Parliament Station is 8 minutes by foot and Melbourne Central Station is 9 minutes.